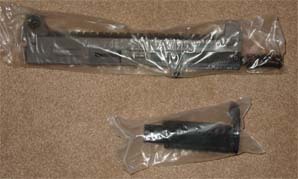 Some time in September 2005 I first saw a post about this new upper on the market that would transform your stock SWD M-11/NINE into a truly nice SMG. Skeptical, I kept watching the message boards for a few more reviews but couldn’t wait any longer so I decided to take a risk and get my self on the waiting list for one. LAGE’s waiting list requires no money down and no commitment. You can pull out any time, and if you don’t have the money when your number is reached you can drop out or move to the back of the list again. You can go to LAGE’s website here and request to get in “line”. After I requested to be put on the waiting list, Richard Lage personally emailed me and let me know my number was 86, and the wait would be 8-12 weeks. I offered to pay up front for the upper but he didn’t want to accept it because no product had been delivered yet. By late March I had yet to receive a email that my upper was ready so I emailed Richard asking for a update. He said my number would come up mid-may. Looking at some of the message boards I recall reading a post that Richard had some issues with waiting on a batch of barrels. Sure enough, mid-may I received an email with instructions and an order sheet because my number had come up and my upper was ready. I sent the payment and within 2 days the upper was at my door. 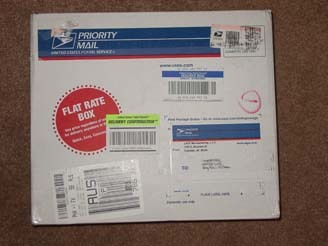 The shipping box had no markings that signaled that anything gun related was packaged inside. This is a good thing since it keeps postal employees with sticky fingers from getting your stuff. When you open the box and take out the contents every part is sealed in it’s own plastic bag and is wrapped with packing foam. When I managed to get all the packing materials off of the parts I couldn’t help but to just sit there and admire how much thought went into this upper. The upper is a simple & elegant design with no complex retardation devices, or fancy gas systems to slow the ROF down. Just a large and properly balanced weight that is bolted on top of a M-11 bolt and fits into the top portion of the upper. Installation is simple and requires no modification to the lower receiver of your SWD M-11/NINE. 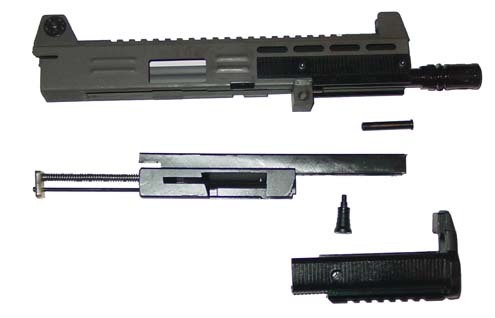 To install the LAGE upper you remove the stock upper from your lower and then insert the LAGE upper into the lower the receiver. 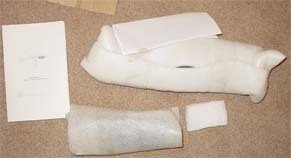 Once it is seated take the front hand guard and slide it through the front of the barrel and then into position so the take down pin can be inserted. The LAGE take down pin can now be inserted to lock the system together. And that’s it! I took it to a friends place and put 1/3 of a magazine through it just to see if it functioned. A few days latter I was on my way to the Bullethole range in San Antonio with a friend (known as daemon734) to really test out the upper. Before I get into my range report I want to go over every thing the upper has. From just looking at the list of features on this upper you instantly get images of a “bubbafied MAC”. Fortunately the entire package looks good and fits into the M-11’s “lines” so well it looks like a completely different SMG. Now back to the range report, we brought approx 1,200 rounds of 9mm of Winchester White Box, a PACT timer, and 5 STEN (my M-11/NINE is converted) magazines with loaders. With great anticipation I installed the first magazines, shouldered my weapon, & then took aim at the paper target. I pulled the trigger and felt the bolt slam forward but the weapon failed to fire. Perplexed I removed the loaded magazine and pulled the bolt back slowly and noticed a round was chambered and the primer was dented but it did not shoot. Then BANNNNGGG!!! Luckily I had the thing pointed down range even though the round probably cleared the first berm. This was the first time I have ever had a round do this, apparently some thing must have been wrong with the primer because it went off a good 30 seconds after it had been hit. And boy did I feel like idiot, having a accidental discharge (even though it was the ammos fault). Remember, safety is paramount! Wanting to redeem myself I reloaded the magazine and pulled the trigger again and the gun started to shoot. I got approx 6 shots off and then it jammed. Embarrassed because I was telling every one how this upper should transform the gun and here I was with it jammed. I cleared the jam and got another string of shots off and it jammed again. Now I was really feeling like an idiot. I let my friend try the magazine he just loaded and just like the last magazine it would jam every 5 or 6 rounds. At this point I was telling every one it probably just needed to be broken in. I inserted another magazine and I was able to finish the entire magazine with out a hiccup. My friend then inserted a fourth magazine and was able to dump it down range with out a problem. That’s when I had a “epiphany”, the magazine’s were causing the problems. I reloaded the first two magazines we used and sure enough these would jam every few rounds. When I would use the last two magazines though, the gun ran flawlessly. STEN magazines are known for having problems because of there age, but these magazines all ran flawlessly with the stock upper so I assume the slightly tighter tolerances of the LAGE upper were causing issues with some of the magazines. Now that we had filtered out the bad magazines we were really able to put the LAGE upper through its paces. The first thing I noticed is the upper was shooting a little low. So with a few clicks on the front sight we had it adjusted perfectly. With a stock M-11 upper this would have been impossible. Once sighted, we were able to put just about every round in a magazine into the target even while holding down on the trigger because there was almost no muzzle climb. Singles, doubles, triples, or even sixes could be accomplished with out any trouble. After about 300 rounds the targets were literally pieces of paper with no center. When they called “cold range” every one was laughing as we carried the targets back because compared to all the other targets with 2 or 3 small holes ours looked like it had been through the shredder. We had to go purchase another set because there wasn’t any thing left on ours to shoot. Once we had another set of targets mounted we continued to shoot. At this pointed we tried to time the gun’s ROF with my PACT timer. I kept getting a reading of 1,275 which wasn’t correct, apparently it was picking up the echo of the gun. If you divide it by 2 you get approx 637 RPM which I assume is the correct reading. I have noticed a lot of people claiming that at 600 RPM the gun is boring because they can pull the trigger on a semi auto faster then this. Well these people are full of crap, unless they are “bump firing” or are some kind of world record speed shooter 600 RPM is way faster then any one can consistently pull the trigger. In fact I will challenge any one with a semi-auto M-11 (with out “bump firing”) and race me to see who gets to the end of a 32 round magazine first. At the end of a 1,000 rounds the only malfunctions operationally we experienced were all because of the first two STEN magazines we used. 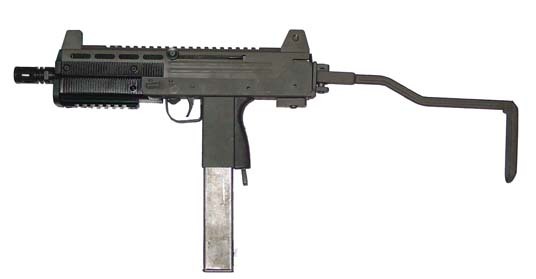 Overall the LAGE upper turns the SWD M-11/NINE into a SMG that is in the same class as the MP-5 and UZI all for significantly less the then cost of either of the firearms. 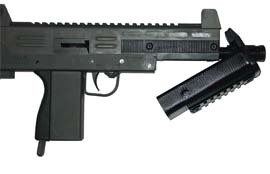 In my personal opinion the SWD M-11/NINE with the LAGE upper is better then a UZI (don’t hate me) because the heavy bolt in the LAGE upper distributes the weight differently then the heavy bolt in the UZI does so the gun doesn’t “knock” you around when shooting it allowing more rounds to end up where you want them. Also the LAGE upper has room for expansion by adding two more rails (available now) and the possibility of incorporating a adjustable bolt weight to fine tune the ROF (there is talk of this). The LAGE upper is the best $650 I have ever spent, it truly transforms your stock SWD M-11/NINE into a competitive SMG. 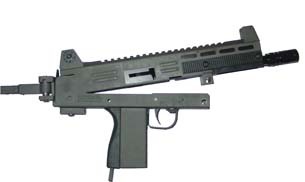 Approx $650.00 US Transforms your SWD M-11/NINE into a SMG that’s comparable to the UZI & MP-5.